Designed by Phillip Liederbach of Liederbach and Graham, this magnificent French style manor is set on 3 glorious acres, providing a private haven in one of Lake Forest’s most desired locations. It’s on the market for $7,900,000. Construction lasted five years before finishing in September of 2009 and this is the first time it’s been available for purchase. Soaring 14 foot ceilings, walls of custom mahogany windows and French doors provide serene views and an abundance of natural light, while intricate mill work, custom marble, limestone and white oak floors and six unique stone fireplaces provide character throughout. There are a total of eight bedrooms, eleven bathrooms, a garage with space for five vehicles and an inviting pool surrounded by lawn and gardens. Star floor mosaics, intricate custom balusters, a panelled library and a dazzling Murano dining room chandelier are just some of the many highlights. Additional amenities include a second chef’s kitchen, a butler pantry, two laundry rooms and a finished lower level with recreation areas and a changing room with sauna. The property also includes a full guest apartment with separate entrance. 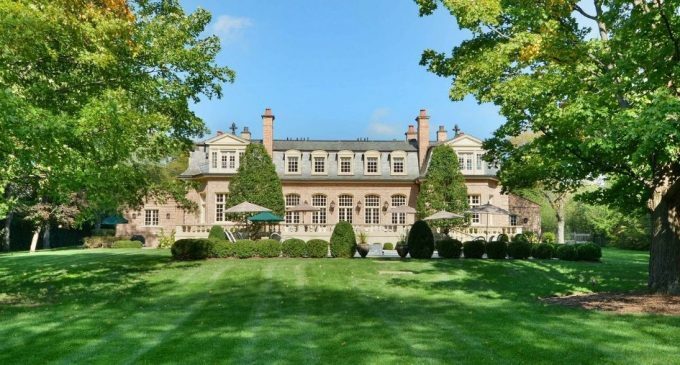 It’s on the market for $7,900,000 with Jean Anderson of Berkshire Hathaway. Annual taxes were $65,105 in 2017. We recently featured another Liederbach designed home in Glencoe, Illinois. Check it out here!